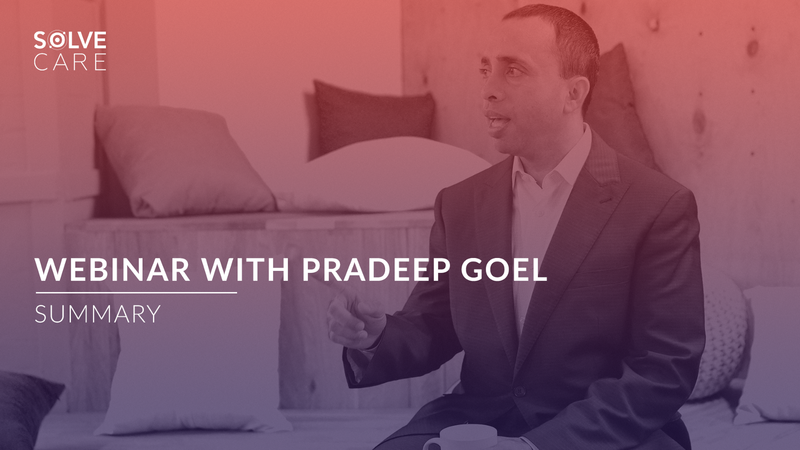 Last week, CEO Pradeep Goel hosted two live webinars explaining Solve.Care platform, its mission and the components we are developing, the future goals for the company we strive to achieve. The webinars were met with a massive interest and wide success from the community, so for everyone who missed the live streams — here is a recap of everything that has been mentioned by Pradeep. - Care.Wallet is an app container application that is convenient for all healthcare stakeholders — patients, doctors, pharmacists, employers, and insurance companies. It contains decentralized apps called Care.Cards. - Care.Cards enable Care.Wallet to function appropriately to the role of stakeholder. The Cards can be synchronized and connected across the different Care.Wallets with the help of blockchain technology. - Care.Coin is a sponsor issued digital currency of the platform. It is a stable coin that the clients can issue into the Care.Wallets of their stakeholders and redeem against the clients’ reserves. - Care.Protocol is the relationship model of healthcare on blockchain. Clients define who they can pair with, who they can transact with and under what scenario. These relationship pairs govern the behavior of Care.Wallet during the interaction with other wallets. - Care.Vault allows for both single ownership and multi-ownership data to be stored off the Blockchain. However, the references to data are stored on Blockchain. This way the clinical data is safely secured in Care.Vault, so only the Care.Wallet holder and the Care.Vault itself have access and consent rights over. The data from Care.Vault can be shared with other stakeholders. For example: if a physician sends clinical data to the patient, that data belongs to both of them. This data is in the shared cabinet in the Care.Vault. All these layers combined to give an incredibly powerful healthcare operating system that can be used to address benefit delivery, care coordination and payment administration for different healthcare administration models. Solve.Care platform operates via business to business to consumer model. The platform can be used by insurance companies, government agencies, employers who want to sponsor healthcare for their employees, large clinical networks, managed care organizations, pharmaceutical companies. Different clients have different needs and different use cases. These use cases are presented to the stakeholders in the form of Care.Cards. - Solve.Care has signed the first major client, Arizona Care Network and deployed them in the second year of 2018. We have seen strong adoption of our product by physicians through our Care.Wallet and now ACN decided to expand the network to include their patients. - Solve.Care launched Care.Wallet for Family application which is GDPR and HIPAA compliant and is available in around 80 countries. - Solve.Care completed the token sale in April 2018. The SOLVE token is now available on Bittrex, Kucoin, and Upbit. - Solve.Care signed a partnership with the Dinocrates Group, to focus on the US government opportunities, in particular, federal government space around central Medicare and Medicaid services. We have developed partnerships with technology vendors like Sigma, GoBlock, and LITSLINK. - Solve.Care has signed a significant partnership with a ridesharing company which will be announced shortly. - Solve.Care Academy has launched. - Solve.Care plans to publish more Care.Cards in the market, covering benefits, clinical care, healthcare payments. In addition to that, we plan to announce more partnerships regarding care delivery and disease management. - Solve.Care will be announcing a partnership with an IoT company to capture data. - Solve.Care will be announcing a major partnership in Asia. - Solve.Care is planning to do an equity round to support the growth of the company. - Solve.Care will be extending the platform and footprint to Asia a year ahead of the initial schedule. - Huge populations with a need for better care and access to care regulated under the archaic system. - Bigger needs with a basic system provide Solve.Care an opportunity to bring advancement to their healthcare market. - There is no need to build a complex centralized network if they can roll out a peer-to-peer platform by Solve.Care. The world is talking about Solve.Care, and we are building a global brand. Platform to redefine care, cost and convenience of healthcare around the world.